"Like a lot of audiophiles, I've often thought of my "retirement" system as being centered around the ease and simplicity of a good integrated amp. In spite of many years of thinking of myself as a low powered tube amp kind of guy, I have to say, I could very happily and enthusiastically retire with the KWI200 as the centerpiece of my system. It is a joy to listen to, to use, and even just to look at. Very highly recommended." "I believe that Dan Wright has really "hit the ball out of the park" with his new KWI 200 Integrated Amplifier. 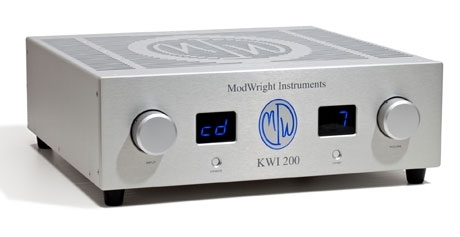 Because of its build quality, handsome, physical appearance along with its beautiful rendering of the music's timbres, warmth and details without losing its punch or macro-dynamics, I would classify the KWI 200 as one of the best integrated amps on the market today, regardless of price." Her kan du stille oss spørsmål angående Tester skrevet om Modwright KWI-200. Vi skal forsøke å svare deg innen 24 timer.